Welcome to my tour of the Modern Quilt Guild Showcase at the Houston Quilt Festival. I am including the information that was presented on the show labels so you can learn a little more about the quilters, their process, and what inspired each piece. I'll present the exhibit in several installments for fear of inspiration overload. Enjoy! For many years I have favored using geometric shapes in my graphic designs, creating two and three-dimensional works for corporate America. I print my designs onto cloth and quilt them as you would a would a wholecloth quilt. I use computer technology to create original designs with bold geometric patterns, then integrate fiber traditions like stitching to create rich texture on the design's surfaces. This circle quilt is my take on the traditional drunkard's Path pattern. I like quilt that a bold, graphic, and organized. For this quilt, I took my favorite part of the Drunkard's Path, the circles, and made a complimentary color quilt using only circles. The fabric was all hand-dyed by me. I spend part of my summers on an island in the Northern Pacific, off the coast of Canada. While I was at the coast, I thought a lot about just being in the moment, about being still enough that the hummingbirds let you see them, and about spending more time being, not always doing. The colors are taken from the sun drenched northern Pacific Ocean beach palette. The texture is meant to evoke weather eroded rocks, driftwood, cliffs, and shells. I hope you might also think of waves, tides, wind, and even rain and ocean storms. 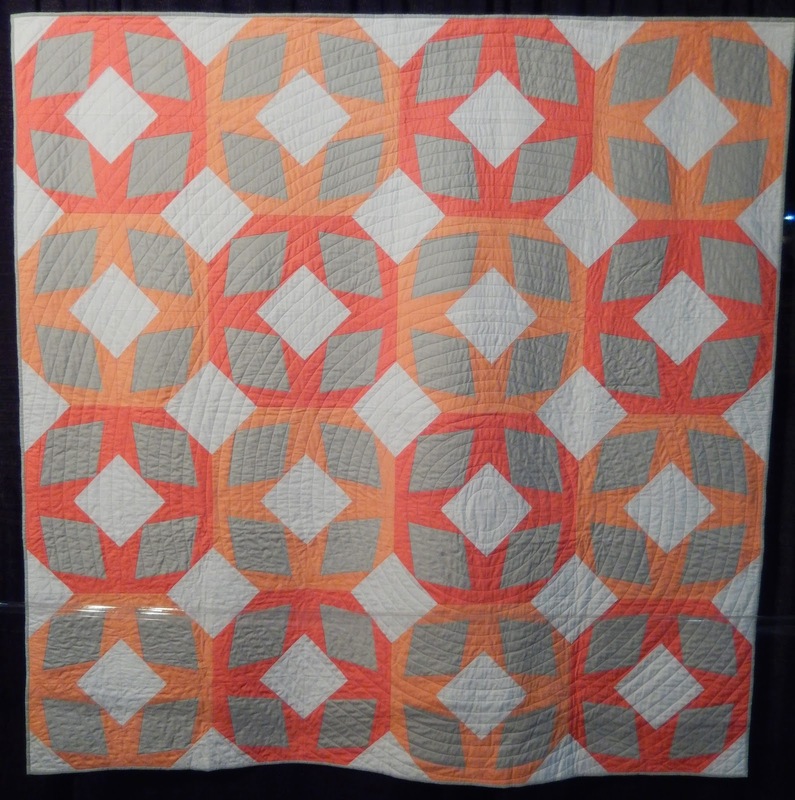 This quilt was based on an improvisational quilt score from the Improv Handbook for Modern Quilters by Sherri Lynn Wood. The assignment was to create strip pieced sheets of fabric, each different from one another, and then sub-cut these to make a final quilt. All fabrications and designs were meant to be decided by me. I loved the idea of using a traditional pattern along with the string pieced blocks of different values to create a non-traditional quilt. Garden designers of the 17th century used principles of forced perspective to create vistas that appeared endless. Inspired by the Grand Canal of the gardens of Versailles, designed by Andre Le Norte, the radical foreshortening of the forms in this quilt evoke the same sense of infinite perspective that the gardens were meant to convey. Thile this quilt suggests three-dimensional space using the most minimal of shapes, it nods toward the opulence of the French Golden Age court with its intricate quilting and reverse-rounded corners. 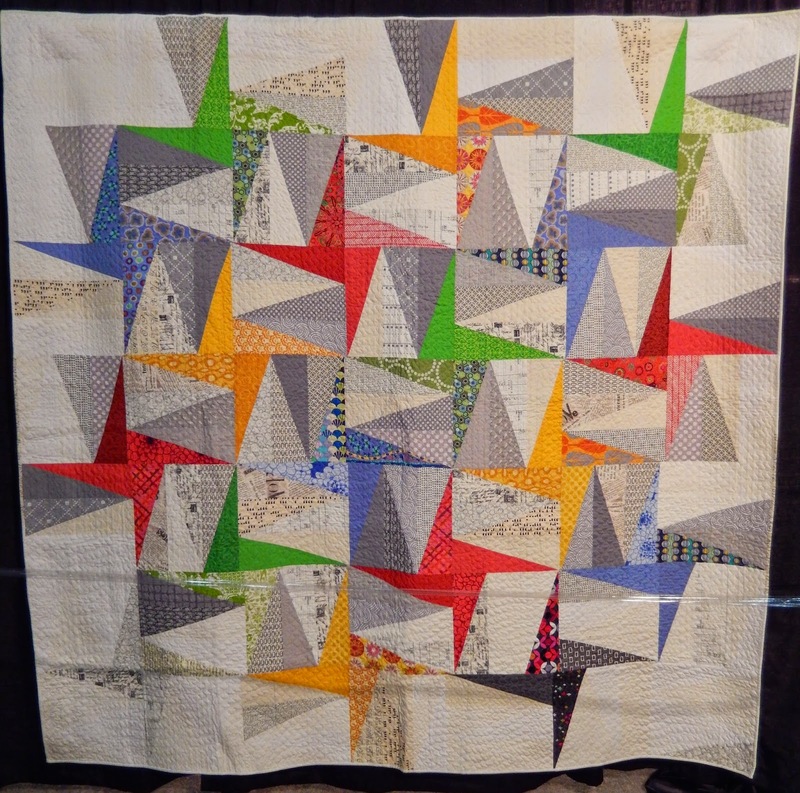 This quilt is the result of the Colorful Colorado Quilt Challenge sponsored by Free Spirit Fabrics. The title, layout, and design are my interpretation of things that make Colorado wonderful, the Four Corners region, four-teeters, four seasons, and Colorado's commitment to green energy by four-blade wind tourbines. The sponsored fabric had to be visible on the front, any other fabrics could be added. This quilt is foundation pieced with solids and suppressed blocks to create a bold geometry design with clean lines. Depending on how you look at this quilt, secondary designs emerge. 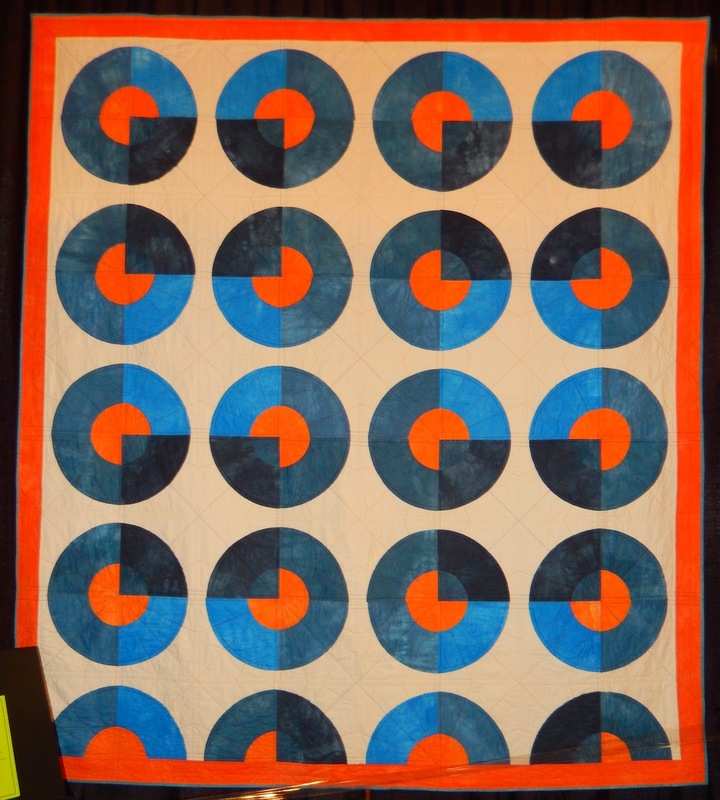 The quilting is done in concentric circles, beginning at the lower right of the quilt's center to soften the geometric look. Cycles 2 really speaks to me - I think the close matchstick quilting really adds the finishing touch to the beachy feel for me.